Acer announced a rather large AMD-powered Chromebook at CES, the Chromebook 315. The new laptop has a 15.6″ display and is available with up to 8GB of RAM and an optional touchscreen. The specifications on the base model aren’t clear, but we’d guess you’re looking at 4GB of RAM and a non-touch display for the bare bones, which Acer says will start at $279 here in the US. AMD comes into the Chromebook game at an interesting time – there are no 15W Intel Chromebooks at this price point, while AMD may lag behind Intel in some regards. 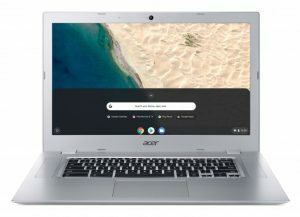 If AMD can play at these kinds of price points and still offer strong battery life – the Chromebook 315 gets around 10 hours, according to Acer – it could well become a favorite in the entry-level Chromebook space. The information for this post was taken from an article by David Ruddock in Android Police, follow this link for the complete article and details. Here are some additional sources to get different viewpoints on this new model: 9TO5Google, Business Review, Slash Gear, liliputing, CISION, PCQuest, betanews, and About Chromebooks.